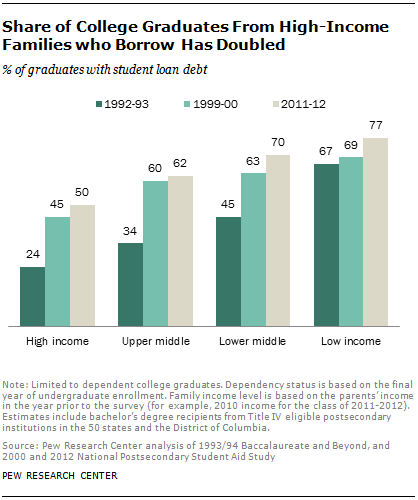 The rise in the rate of borrowing was also substantial among upper-middle-income graduates, with 62% of 2012 graduates from upper-middle-income households leaving college with debt, compared with 34% roughly 20 years ago. While graduates from the highest income homes saw a faster rate of increase in borrowing, those from low-income families continue to be more likely to graduate with student loans. While graduates from the highest income homes saw a faster rate of increase in borrowing, those from low-income families continue to be more likely to graduate with student loans, with 77% graduating with debt in 2012, compared with 50% of their most affluent peers. And the share of low-income graduates who borrow has also increased in recent decades, rising from 67% to 77% over a period of roughly 20 years. But the rate of increase in the likelihood of borrowing has been much more modest among graduates from the lowest income group than it has among middle- and high-income graduates over the past 20 years. The Pew Research analysis shows, similarly, that there has been a sharper increase in student borrowing among graduates with more highly educated parents. In the class of 2011-2012, some 61% of students whose parents also had graduated from college left school with some student debt. This represented a 50% increase compared with students from similar backgrounds who graduated 20 years earlier. The increase in borrowing among students whose parents have less education was significantly smaller, although those students remain more likely to borrow. Among recent college graduates who borrowed, the typical amount of cumulative student debt for their undergraduate education increased from $12,434 for the class of 1992-93 to $26,885 for the class of 2011-12 (figures adjusted for inflation). The increase in the median amount of debt by newly minted borrowers between the class of 1992-93 and the 2011-12 varied somewhat by the graduates’ economic circumstances. But regardless of family income, the typical amount owed at graduation increased about twofold over this time period. The profile of student borrowers has shifted not only along economic lines but also by gender. Female graduates are now somewhat more likely than male graduates to have borrowed money to finance their college education, and women in the class of 2012 owe more of the total student debt than their counterparts in the class of 1993. Again, most of the change is apparent in rates of borrowing. In the class of 1993, female graduates (49%) were about equally as likely to borrow as male graduates (50%). In the class of 2012, female graduates (71%) were more likely than male graduates (67%) to borrow. This new gender difference in student borrowing may reflect the fact that female college students and graduates tend to be from more disadvantaged family backgrounds than their male counterparts (Buchmann and DiPrete, 2006). The typical amount owed at graduation increased about twofold between the class of 1993 and 2012 for both men and women. The characteristics of student borrowers are relevant to at least a couple of ongoing discussions surrounding student debt. The creditworthiness of student borrowers has come under much scrutiny (Fry, 2014). Delinquency rates on student debt have increased (Lee, 2013). Among young debtors, those with student debt once had similar credit scores to those lacking such debt. Economists at the New York Federal Reserve have shown that now young student debtors have significantly lower credit scores than those without student debt (Brown, Caldwell, and Sutherland, 2014). The decline in creditworthiness is thought to perhaps be tied to the expansion of postsecondary education and the participation of students from lower income backgrounds. At least among those completing a bachelor’s degree, however, student borrowers are not increasingly from less affluent circumstances. The decline in the credit quality of student borrowers may not be due to a change in the economic profile of student borrowers. In addition, a number of recent proposals to relieve the educational debt burden involve student debt forgiveness to varying degrees (Gale, et. al., 2014). The distributional implications of who stands to gain from such relief are important to the analysis of such proposals. The remainder of the report provides some background information on the rise in student debt since 1990, as well as trends in the accumulated debt of students finishing bachelor’s degrees. It also includes new findings on student debt outcomes by family background and gender, rates of borrowing, the median amounts borrowed by graduates and an analysis of which groups owe what shares of the total debt. The final two sections of the report present some of the common explanations given for why student borrowing has grown so much over the past two decades. Findings in this report are based on the National Postsecondary Student Aid Study (NPSAS). Collected by the National Center for Education Statistics, NPSAS is a nationally representative survey of undergraduates designed specifically to measure how undergraduates and their families pay for their education, with a particular focus on federal student aid programs. The most recent administration includes undergraduates enrolled any time between July 1, 2011, and June 30, 2012. The analysis is limited to newly minted bachelor’s degree recipients or undergraduates who obtained their bachelor’s degree in the year the survey was administered. Recent college graduates’ total cumulative borrowing includes both federal and private loans. Other nationally representative datasets possess information on the outstanding student debt owed by a household or adult (for example, the Federal Reserve’s Survey of Consumer Finances or the New York Federal Reserve Bank’s Consumer Credit Panel). The outstanding student debt may include educational debt incurred many years before the survey. The respondent’s economic profile is largely limited to the current snapshot, and there is no information on the borrower’s upbringing or parental socio-economic situation. The NPSAS reports parental income and education for dependent undergraduates. Parental income is not reported by the student but derived from the student’s financial aid application. Though the available measures NPSAS provides may not be ideally suited to capture the student’s permanent or long-run economic advantages during childhood (Ellwood and Kane, 2000), NPSAS is a preeminent data source for understanding how undergraduates’ financial resources impact their utilization of student grant and lending programs (Baum and Steele, 2010). Further details are in Appendix B. This report focuses on the family income background of recent college graduates who took on student debt and how the financial profile of borrowers has changed over the past 20 years. 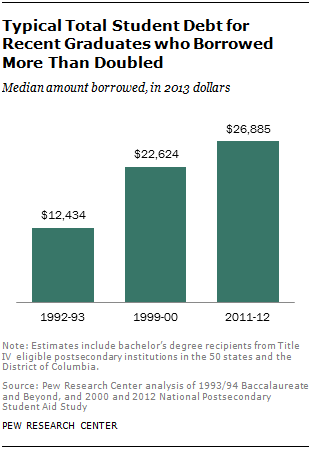 Many recent analyses have examined why undergraduates are borrowing more for their education. This analysis seeks to illuminate which undergraduates are increasingly borrowing to finance their completion of a bachelor’s degree. Understanding the changing income background of student borrowers is useful for illuminating why college graduates may be having greater difficulty in meeting their debt obligations as well as understanding who might benefit from proposals to shift the repayment of loans from the student to the government. Find related reports online at https://www.pewsocialtrends.org/topics/student-loans/. This report is a collaborative effort based on the input and analysis of the following individuals. Claudia Deane, the center’s director of research practices, and Kim Parker, director of social trends research, provided editorial oversight. Richard Fry, senior economist, wrote the report and analyzed the National Postsecondary Student Aid Study. Eileen Patten, research analyst, finalized the charts and tables and number-checked the report. Molly Rohal, communications associate, copy edited the text. A “college graduate” refers to an undergraduate who received a bachelor’s degree in the year that the data source (National Postsecondary Student Aid Study) was collected. Student debt refers to the cumulative amount borrowed by graduates during their undergraduate education. It includes federal loans as well as private loans. It excludes loans taken out by parents or guardians (for example, PLUS loans).